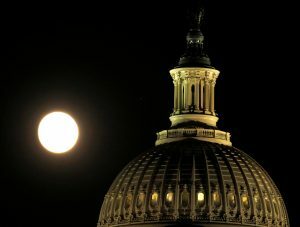 WASHINGTON — Congress is doing the bare minimum to keep the country running, readying a short-term spending bill to keep the lights on in government past Saturday, when President Donald Trump will mark his 100th day in office. The short-term legislation will carry through next week, giving lawmakers more time to complete negotiations on a $1 trillion government-wide spending bill for the remainder of the 2017 budget year. The government is currently operating under spending legislation that expires Friday at midnight, so action is required before then. In addition to the failure to come up with a spending deal that could pass ahead of Trump’s 100-day mark, the House GOP looked unlikely to give Trump a victory on health care before then. A revised health care bill has won the support of the hard-right House Freedom Caucus, holdouts on an earlier version that collapsed last month, but GOP leaders were struggling to round up votes from moderate-leaning Republicans. “I don’t know if it’s bringing anyone over,” said Rep. Chris Smith, R-N.J., who said he had been lobbied by leadership but still opposed the legislation because it undoes an expansion of Medicaid under former President Barack Obama’s Affordable Care Act. “There’s much of Obamacare that has to be fixed. That part of it is critical,” Smith said. Trump himself unleashed a tweetstorm of criticism of Democrats involved in negotiations on the spending bill, accusing them of trying to close national parks and jeopardize the safety of U.S. troops. “As families prepare for summer vacations in our National Parks – Democrats threaten to close them and shut down the government. Terrible!” Trump tweeted. “Democrats jeopardizing the safety of our troops to bail out their donors from insurance companies. It is time to put #AmericaFirst,” he wrote. President Trump came to office intent on shaking up Washington. While he’s run into obstacles in Congress and the courts, there have been clear victories. John Yang offers a recap of the president’s domestic moves, and presidential historian Michael Beschloss and Barbara Perry of the University of Virginia Miller Center sit down with Judy Woodruff to discuss how he compares to his predecessors. Nonetheless, leaders in both parties projected certainty that a deal would ultimately be reached on the spending legislation, which covers all government agencies and is leftover business from last year. “Talks on government funding legislation have continued throughout the week on a bipartisan, bicameral basis,” said Senate Majority Leader Mitch McConnell, R-Ky., adding that the short-term extension will allow time for a final agreement to be completed and voted on next week. The talks involving congressional Republicans and Democrats had progressed relatively smoothly after the White House earlier this week had backed off a threat to withhold payments that help lower-income Americans pay their medical bills and Trump dropped a demand for money for the border wall. After the U.S.-Mexico wall issue and the Obamacare controversy were addressed, negotiators turned to a lengthy roster of unfinished issues, many of which involve extraneous policy “riders” on the environment and financial services regulations. Negotiations continued throughout Thursday toward an agreement that might not be revealed until early next week. Associated Press writers Andrew Taylor, Kevin Freking and Alan Fram contributed to this report. WATCH: What have we learned from President Trump’s first 100 days?